I really wanted to like this movie more than I did. But I didn’t. I only liked it exactly as much as I did. At the heart of it, it was still just a formulaic underdog sports movie, complete with audio-driven video montage in the middle of it. Here’s my issue with the movie. 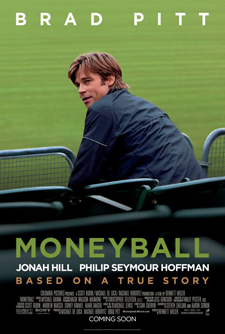 Brad Pitt starts out by making it to the playoffs with money problems. In baseball. Not basketball, where 4 or 5 teams get to the playoffs every year with a losing record. It’s pretty prestigious. Then his three best players leave for bigger contracts, so he tells his staff they need to start thinking differently. How?Well, I don’t know. Bring me a rock. No, that’s not the one. Bring me another rock. Nope. That’s not it either. Then he meets Jonah Hill, who has a nice looking rock. So he buys it and goes all in with it. It’s a fun concept and I love the idea. But in the end, they get to the playoffs and prove to the world that they can do just as well as they did last year. People all around say “good try.” I know it was based on a true story, but it’s not billed as an educational documentary like Inside Job or The Cove. And after over two hours, just when I expected some sort of climax, there was white text on a black screen saying that he revolutionized the way people looked at the game and his idea brought success to another team. Oh, and not just any team, but the team that took his star player from him, who happened to be Jonah Hill’s example of somebody that this method has proven is not valuable. So the movie instead overdramatized the record-setting 20-game win streak in the middle of the season only to immediately dismiss it when Brad Pitt admitted the streak meant nothing. The goal was a World Series. Which they didn’t achieve. What do you want us to feel, movie people?